Marvel decided to officially end the Fantastic Four comic book series earlier this week. This comes in the wake of the Fantastic Four reboot bombing this past summer. And 20th Century Fox has officially canceled the sequel The Fantastic Four 2, which was supposed to hit theaters in the summer of 2017. So, this means we won't see Fantastic Four return in any medium for quite sometime. And that comes as a disappointment to Michael B. Jordan, who played Johnny Storm, aka The Human Torch. He still wants to come back to reprise his iconic Marvel character. 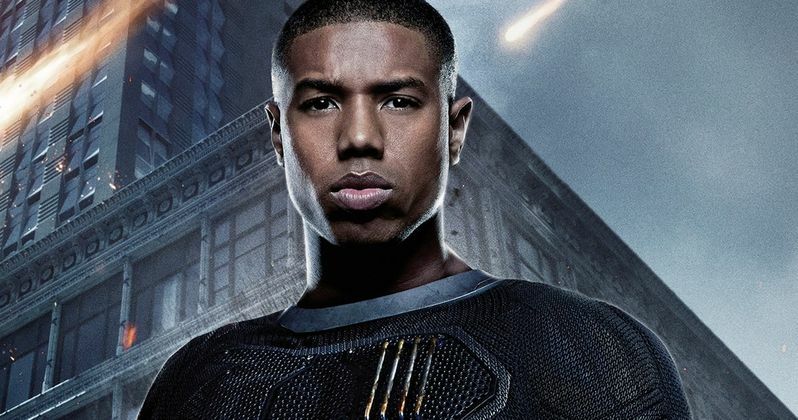 Despite all the backlash that happened after the Fantastic Four opened this past August, Michael B. Jordan wants it known that neither the studio nor the filmmakers ever set out to make an unwatchable movie. The Creed actor recently talked to IGN, and discussed some of the behind the scenes details. He had this to say about the train wreck of a reboot. "I look back at the film as a learning experience. Every film isn't going to be a home run. Everybody involved didn't set out to make a film that didn't work. I think everybody wants to do the best job possible. I think it was a big education for me to realize that things aren't in your control, and you can do everything you're supposed to do. You can give 110% every day, and the movie still not work out. But that may or may not be on you and you've got to be OK with that. Moving onto the next thing. For me, first thing off I had this project [Creed] coming on right after so it makes it a little bit easier to swallow." While everyone had high hopes for Fantastic Four before it opened, the movie's disappointing performance at the box office had to come as a blow for its cast. It's the kind of devastating experience that one might not be eager to relive. But Michael B. Jordan doesn't see it that way. He thinks this franchise could be salvaged. Asked if he thinks he'll ever return to the character, he has this to say. "I'm not sure man. Honestly, there are so many things outside of the actor's control. You know, as much as we want and we like these characters, and we like these worlds and stuff like that, we have such a small say in what goes on behind closed doors - all that other, extra stuff. Also, I love the character. I'm a big comic book fan, and that's one of the reasons I wanted to do it in the first place. We'll see what happens. Johnny Storm is an incredible character. [Do i want to return?] Why not?" While Michael B. Jordan is currently enjoying much success playing Apollo's son in the Rocky spinoff Creed, Fantastic Four came as one of the biggest disappoints in his career thus far. And it was a movie that certainly disappointed fans. What do you think? Do you want to see The Fantastic Four 2 with the original reboot cast return? Or do you want to see Fox hand this property back to Marvel, where they might reboot it for a third time with a completely different cast? Seems to be working for Spider-Man, or is it? Let us know your thoughts in the comments below.